Stewart Vernon ’02 was destined to be an entrepreneur. It wasn’t really a question of if he would start his own business; it was only matter of what type of business. But once he struck on the idea of a pool-cleaning and repair service while still a business major at the College of Charleston, he dove right in. 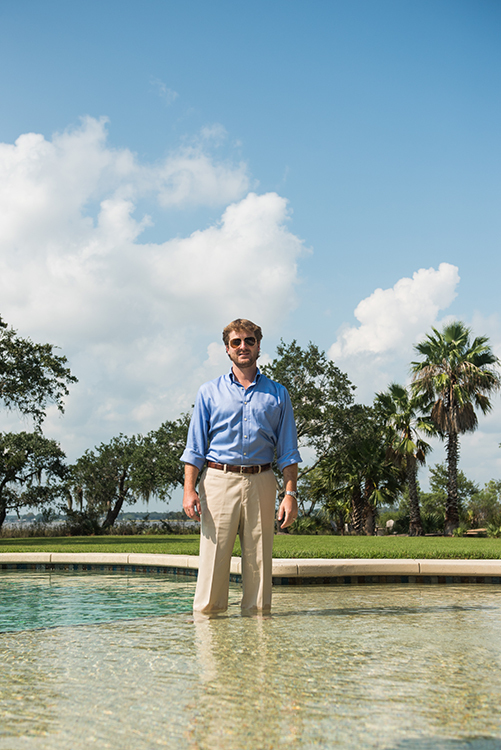 Today, America’s Swimming Pool Company, of which Vernon is founder and CEO, is the nation’s largest pool maintenance and repair company, with franchises in some 250 U.S. cities. Identifying a need and then providing a service is a theme that began early in Vernon’s life. When he was 12, he quit the baseball team to start selling baseball cards out of his parents’ basement. At 13, after discovering that stores near his home in Macon, Georgia, didn’t carry a particular brand of sour candy that kids at his school liked, he convinced his mom to drive him all the way across town to a store that sold the candy so he could buy a whole case. His backpack stuffed with the sugary treats, he began selling off his supply to classmates for a tidy profit. “It was at that time I discovered supply and demand, mixed with good profit margins,” he explains. A serial entrepreneur by this point, Vernon next ventured into the car washing business at the ripe age of 15. By the time he graduated from high school he had a roster of more than 100 customers and two employees. Naturally, he majored in business at the College, each course building his foundational knowledge in the principles of business, marketing and communications. But it was a seminar in entrepreneurship taught by luxury car dealer and businessman Tommy Baker that truly awoke Vernon’s entrepreneurial spirit. “The weekly speakers we were given access to, the lessons from Tommy, and the class project we had, were all things that none of us as students could have received anywhere else,” Vernon recalls. The timing could not have been better: While taking Baker’s class during his senior year, Vernon was developing a business plan for a pool cleaning and repair business in his hometown of Macon. His desire to start a business, mixed with weekly doses of inspiration from the entrepreneurship class, was the perfect combination. He was named “Entrepreneur of the Class” and awarded a $500 check from Baker, which he promptly invested into his business idea. A week before walking across the Cistern stage at graduation in 2002, he signed up his first few clients. And from there, he built the business one account at a time. After a few years, it was time to expand the business into new territories and franchising was the logical route, he says. A friend of his started up the Charleston franchise; a relative launched another in Clemson. By 2006, he had five franchisees. And today he has nearly 100 spread across 24 states. Inspired by the entrepreneurship lessons he learned from Baker, Vernon has been a regular guest lecturer in business classes at the College and was instrumental in helping to fund the establishment of an entrepreneurship-in-residence program in the School of Business, where he also serves on the advisory board of the Center for Entrepreneurship. Using the entrepreneurship seminar that he took with Baker as a model, Vernon recently established a similar entrepreneurship program at Mercer University in Macon. He is the program’s first entrepreneur-in-residence.